As a permanent form of skin art, tattoos have a way of sticking around. But just as with any type of body alteration, we may eventually outgrow the way we feel about our tattoos. In those cases, a tattoo removal procedure may be necessary. 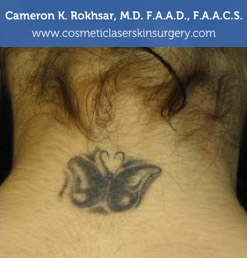 Dr. Cameron Rokhsar is among the best laser tattoo removal specialists in New York, in large part due to his familiarity and expertise in laser procedures. Indeed, most cosmetic surgeons now consider laser tattoo removal to be the most effective means of permanently mitigating tattoos. Laser tattoo systems, such as the Q-Switched laser, have drastically improved the performance of tattoo removal in Long Island. 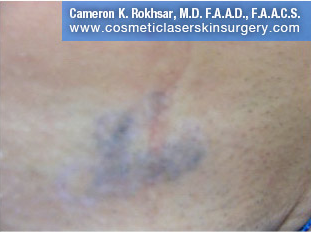 These modern systems have a very low risk of scarring as they remove the pigment. Additionally, Q-Switched Lasers work on many pigment types and colors, including blues and blacks (which previously were difficult to target). This means that a wide variety of new patients now have access to laser tattoo removal procedures, so even if you were not a good candidate for laser tattoo removal before, you might be now. The best way to find out is to schedule a consultation with Dr. Rokhsar. 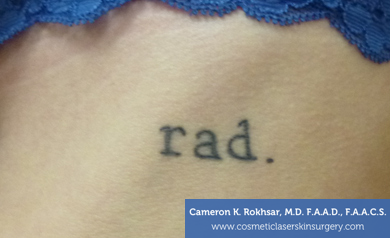 At his practice in New York and in Garden City, Dr. Rokhsar has been able to achieve excellent results with his laser tattoo removal treatment. Patients have remarked that they feel better and, sometimes, more authentic after receiving these procedures. In other words, their bodies are now in tune with their identities. 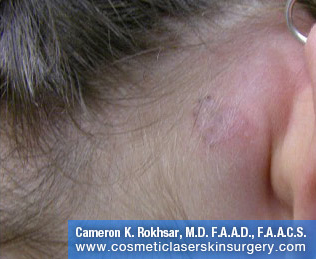 That is a very important aspect of laser tattoo removal procedures. It may take several sessions in order to achieve the results you’re after, but you will notice a diminishment after each treatment. As one of the most qualified laser experts in the world, Dr. Rokhsar is among the best resources for laser tattoo removal in New York. To schedule an appointment – and to finally get rid of those tattoos – contact our offices to schedule a confidential consultation. You don’t have to live with tattoos you no longer want! Get laser tattoo removal today. The cost of NYC laser tattoo removal depends on many factors. Such factors include the size of the tattoo, the location of the tattoo, and the colors in the tattoo. Larger tattoos take more time to fade. Tattoos in certain locations (such as the groin, hands, and feet) require more skill and time to treat. In addition, certain colors used in tattoos, especially bright colors, require more skill in order to erase completely. Such colors include red, yellow, and blue. Being that sizes of tattoos range from a tiny wrist tattoo to a full back tattoo; a consultation with Dr. Rokhsar is the best way to find out exactly how much your removal will cost. 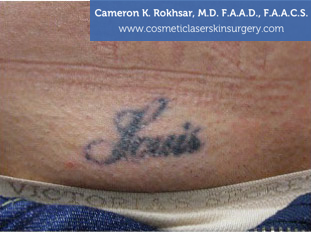 Dr. Rokhsar is a forerunner in the development and usage of the latest tattoo removal lasers. 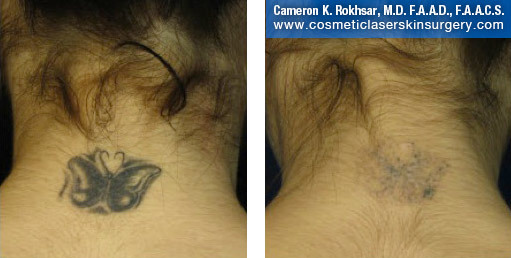 Why choose Dr. Rokhsar for your tattoo removal? NYC dermatologist and laser specialist, Dr. Rokhsar is an internationally renowned specialist with a particular focus on laser tattoo removal and aesthetic procedures. He proudly offers laser tattoo removal to Manhattan, Long Island, and Garden City patients. 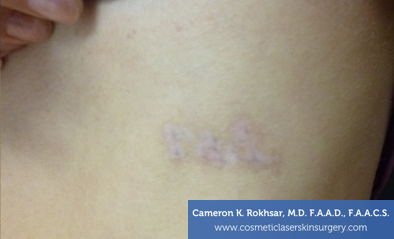 Dr. Rokhsar has successfully removed thousands of tattoos using the Q-switched laser. The laser energy targets only the pigmented ink of the tattoo, not the surrounding skin. The laser energy breaks the ink down into tiny particles. The body then naturally ‘digests’ these particles even further. The tattoo will fade and eventually completely disappear. It is very rare that it is impossible to completely remove a tattoo. 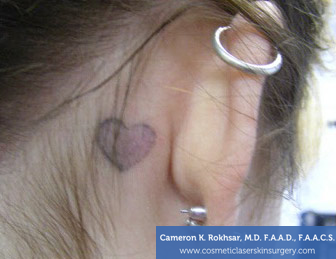 Why should I choose Dr. Rokhsar for my tattoo removal? Dr. Rokhsar has trained thousands of other physicians to use various lasers, including the Q-switched laser he uses for tattoo removal. Throughout his practice, he has successfully removed thousands of tattoos using the Q-switched laser. Dr. Rokhsar has notable experience in removing tattoos even in typically difficult cases such as tattoos on dark skin and brightly colored tattoos. The number of treatments ranges from 3-12 sessions. Many factors are involved in determining the number of treatments you will need. These factors include the amount of ink used, the depth of the tattoo, the colors in the tattoo, and the color of your skin. Some patients have a noticeable difference after each treatment, while others will only see changes after multiple treatments. Having a tattoo removed is no more painful than having one applied. Most patients only have a small amount of discomfort during the procedure. We use numbing cream prior to treatment as well as a cooling device during treatment; both minimize any possible discomfort. The numbing cream is left on for up to one hour. The actual treatment time takes anywhere from 10 minutes and up, depending on the size and location of the treatment area. How should I care for the area after treatment? After a tattoo removal session in NYC, you may apply cold compresses. The tattoo will have a topical antibiotic ointment on it and the area will be covered with gauze. You will be given additional ointment and gauze to replace the dressing as needed. It is best to avoid exercise, swimming, and excess heat (i.e., saunas, hot showers). Swimming should be avoided for the duration of your treatment sessions.Post treatment, you can resume your normal activities. If you notice any blisters, do not pick them- this puts you at higher risk for infection and scarring. Never use harsh scrubs or abrasive washcloths on the treatment area. Protecting the treated area from the sun is absolutely necessary- even after the treatment sessions are finished and healing is complete, be sure to wear sunblock on the treated area.